No one likes change and nowhere is this better exemplified than in social media. It seems as though layouts shift when we least expect them, resulting in layouts that we find to be confusing. While we eventually find ourselves becoming used to such changes, in the back of our minds we wonder, “Why do these changes exist in the first place?” As of late, this has been the thought process of users on Tumblr. It was this past week that Tumblr users were greeted by a new layout. Suffice it to say, they were not happy with what they saw. Most of the complaints stemmed from the fact that the image sizing wasn’t the same. Basically, instead of the 500 pixels for the width, which more or less became the standard on the website, it increased to 540 pixels. Now, you may be on the outside of this spectrum, wondering why a seemingly minute change elicited a vocal response. Forty pixels doesn’t sound like much, right? To best understand this, it’s important to consider what the most common posts on Tumblr consist of. When I think of Tumblr, my mind immediately goes to sets of .gif images, each of them designed with certain sizes in mind. I can also think of artwork that users have spent hours perfecting. However, work like this has fallen prey to Tumblr’s size change, making it come out less crisp and more blurry. After all, these visuals must fit the dimensions set by the social media website, even if it means they are stretched beyond what they were designed for. As you can imagine, it’s artists and simple edit creators who have been affected by this layout change the most and many of them did not take this lying down. Social media has given them a voice. Needles to say, they have taken advantage of it. In fact, this backlash on Tumblr brought life to a petition, its purpose being to revert the website’s photo sizing to what it once was. Now, it can be argued that online petitions rarely solve problems in the long term, so taking the opportunity to sign one’s name probably isn’t going to amount to much. However, the fact that the petition is about 300 signatures – as of this writing, at least – away from hitting its goal of 50,000 signatures is noteworthy. While Tumblr users have their own interests, and probably wouldn’t agree on much if they were in the same room as one another, there is a sense of unity that cannot be overlooked by any social media or online marketing firm. As someone who typically doesn’t create art, on Tumblr, this change in photo resizing isn’t going to mean as much to me as it does to others. However, I still very much enjoy the site and the more negative posts I see about this change, the more I feel empathetic. Many users spend hours, if not days, on the art they create and to have their platform change without warning is unfortunate. While there have been workarounds, which can be found on Tumblr itself, should users have to make this extra effort? It’s a fair point to bring up. 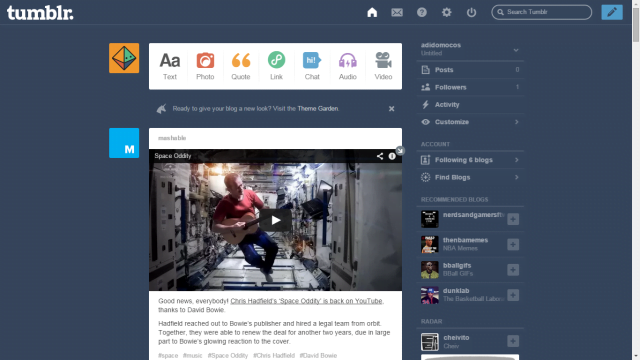 If you are a Tumblr user, how do you feel about the new layout change? Has it affected your work or are you okay with the change in question? Please leave your thoughts below! See also: Will Tumblr Lock Digital Horns with YouTube? Rob Sutter graduated from Farmingdale State College with a bachelor’s degree in professional communications. He currently works for an online marketing firm in Bohemia, NY. Outside of social media activity, Rob is an avid gamer and professional wrestling enthusiast. You can find him on Twitter as well. Hot in Social Media is an independent online community for the social generation founded in 2012.